Home / Myths / Space & Science / What are voids ? Are they really Creepy? Note: Since this is a public post, so they aren't any pictures of heavenly bodies, stars, and voids because of anxiety people feel and might got shocked and not be able to see them. Although no link will be provided related to deep space. Suppose you're traveling in Space in a particular direction with a very high velocity nearly equal to the velocity of light. However, this is a hypothetical concept. While traveling, you're seeing an area where you see neither any Galaxy nor any star, the only thing you see which is darkness. You're going and going into that. As you're going, darkness around you is continually increasing and at once you'll reach a place far enough when there is only dark, an absolute darkness. Are you freaked out with it? Let's think seriously about this. What will happen when you really got stuck in such a place? What will you do? What will your mind do? Your mind will freezed and surely goes in an unknown state by seeing dense darkness and until your death. Also Read "John Titor: Time Traveller or Internet Hoax"
Well, this is only my assumption but possibly this will happen only with those emotional, weak hearted, and sneaky persons. Actually, this depends on the person how their brain reacts. I know you might be thinking, this is all crazy because no such place exists. Yes, you're right because no absolute dark place has been found ever. Besides, the chances of the existence of absolute dark places are very less, nearly zero. It means even dark places are not absolute dark. 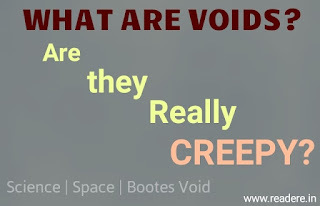 Title: What are voids? Are they really creepy? Voids are empty spaces in the Universe where no stars or galaxies, or a very few stars or Galaxy exists. They can be millions of light years wide. However, their exact size can never be known. These empty spaces look so creepy because the sudden dark place in the bright universe appears odd. However, there're very theories about their formation but most popular are here. Theory 1: Galaxies are moving with high velocities when they move from its initial position, they left a void approximately of its size. This is because when Galaxy moves, they contaminated more and more matter from its pathway and surrounding, due to which, less matter was left behind, which is not enough to form into any star or galaxy. So all of remains behind is there a void. Theory 2: Since energy and matter distribution in the universe is not uniform. So there are chances that, at some places, there is more matter while at some places, there is very less matter available. This all must happen during Big-Bang. So, the places where there is less matter which is not enough to form a larger number of stars and galaxies. So nothing's there rather than a few galaxies. Bootes void is the largest void among all found yet. It is named so because it is located in the constellation bootes. It is the largest empty space in the known universe. It is really one of the most creepiest thing. Bootes void is 330 million light year in diameter which is about 0.27% of the diameter of the known universe and its centerre is about 700 million light years from earth. Also Read "Know 10 Facts and Misconception about USA"
The bizarre thing about it is that according to research, it should have minimum of 2000 galaxies, but according to collected data, only 60 galaxies has been found till 1997. It is founded by Rober Kirshnerer in 1981 along with his teammates. Actually most it arthe e only assumption by Researchers. Nothing is certain, like about its size or formation. It is still unknown that how and why do they exact formed. All these things are needed to find out. According to some rare theories, some says they are gateways to another dimension. But anyone can give their own theory, then why you can't. 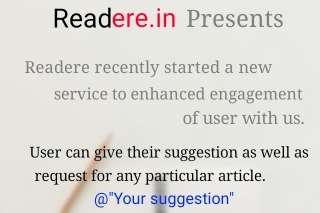 Give your feedback and suggestion below.